Surrounding us there is a constantly vibrating field of energy. These vibrations can be caught within shapes of space and frequencies of time to form patterns that communicate. Undercurrent attempts to bring these subtle movements, and their potential relationships, into our field of focus. The rooms of A — DASH become an expanded instrument. Suspended piano wire, acoustically and electromagnetically amplified, emphasizes the geometry of the room. The harmonic relationships of these tones become visual patterns, through mirrors, speakers, and light. While the noise of the city activates and plays the suspended wires, rhythms from nature sound within the installation furniture. Visitors are invited to lie on the benches and experience listening through the ear, body, and eye. Detail of installation room 1. Piano strings, motors, motion sensors, light diffusion paper. Detail of installation room 1. Piano strings across light diffusion paper. Afternoon light. Detail of installation room 1. Hands on piano strings, light diffusion paper. Detail of room 1: found unpright piano bridge, laser cut bridges, contact microphones. Detail of room 1: motion activated motor attached to found wood with rubber bands, found piano felt. 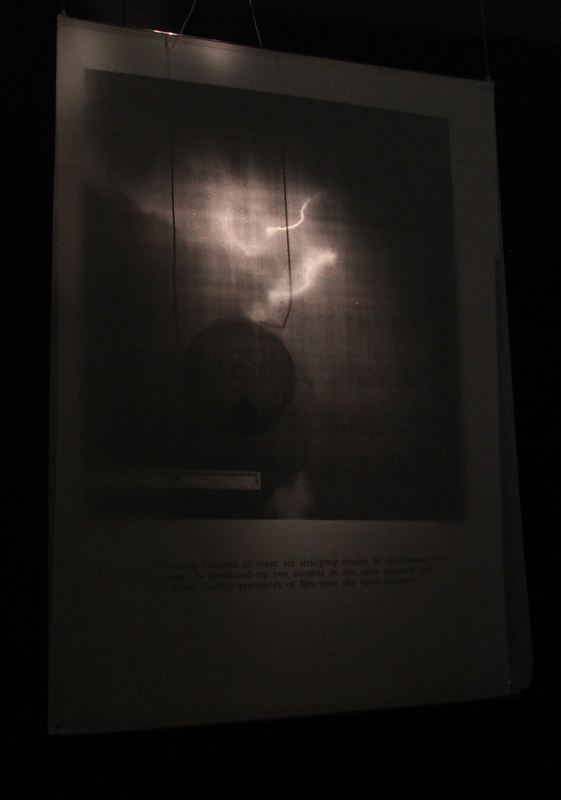 Detail of room 1: motion activated motor with found piano felt, beneath light diffusion paper. This motor when activated hits 2 strings. Detail of installation room 1. Piano strings, motors, motion sensors, contact microphones, found upright piano bridge, light diffusion paper. Detail of installation room 2. Guitar amplifier, mirror, balloon, laser, LED light, enlarger lens. Detail of room 2. Lissajou patterns created by mirrors on balloons on the speakers of a guitar amplifier. Detail of room 2: lissajous patterns created by lasers, mirrors, & balloons on the speakers of a guitar amplifier. Lissajous patterns with balloons, mirror, and guitar amp. The sounds in this composition are recorded in the neighborhood of Metaxourghio, Athens with contact microphones, filtered through materials on the street: parking bollards, tram posts, signs, electric boxes, and fences. Live sound is filtered into the gallery space (Atopos, Athens) via a contact microphone an exterior balustrade sending sound into a pair of transducers on the windows. Still Here is a soundscape of the island of Santorini, in the Cyclades, Greece. The composition includes ambient sounds, talk, and music, exploring shared timelessness. The visual realm of Santorini is littered with signposts of modernity. There are electric wires sagging across the valleys and satellite dishes rusting on roofs. However, the scattered village soundtrack is almost entirely absent of sounds of the modern era. The island has increasingly become a tourist hotspot with local communities replaced by picture perfect facsimiles of themselves. We have selectively edited our recordings from Santorini to create a timeless map. It is fundamentally inaccurate, romanticized, the aural equivalent of a landscape photograph in which all pylons and road signs have been photoshopped into non-existence. Yet it is all drawn from the aural environment as it is today, and likely will be for many years to come. These soundscapes are transmitted on 5 very low power FM transmitters placed at a distance from each other in an empty room, transmitting on the same frequency. Five visitors at a time will be invited to enter the room, each with their own handheld radio receiver encased in a salvaged birdcage from one of Santorini's abandoned village houses. Now illegal, villagers traditionally captured North African goldfinches and decorated their terraces with birdsong. As they move, listeners reconstitute the landscape and its communities through a transmitted sonic landscape. Visitors can opt in and out of the various soundscapes from around the island, choosing to stand by one transmitter only or journeying to different environments: cliff tops, village domesticity, celebration, church bells, singing, shoreline and docks, terraces, rocks and tall grass. Still Here (II) for Santozeum is the second iteration of an installation that transmits soundscapes from the island of Santorini using radio receivers built into locally salvaged birdcages. On this occasion our focus is on sonifying a bird's experience of the island’s magnetic field. Caught and held in tiny cages the bird’s song soundtracks moments of peace for their owners, as they sit surrounded by their cages on roof terraces in the relative quiet of late afternoon. Meanwhile the birds' reading of this pastoral idyll is possibly far more dramatic than listeners might expect. A field in constant flux, especially so due to the island's location amidst a volcanic range, is transmitting continually shifting queues that these birds are more prone to sense, even if they are unable to move. 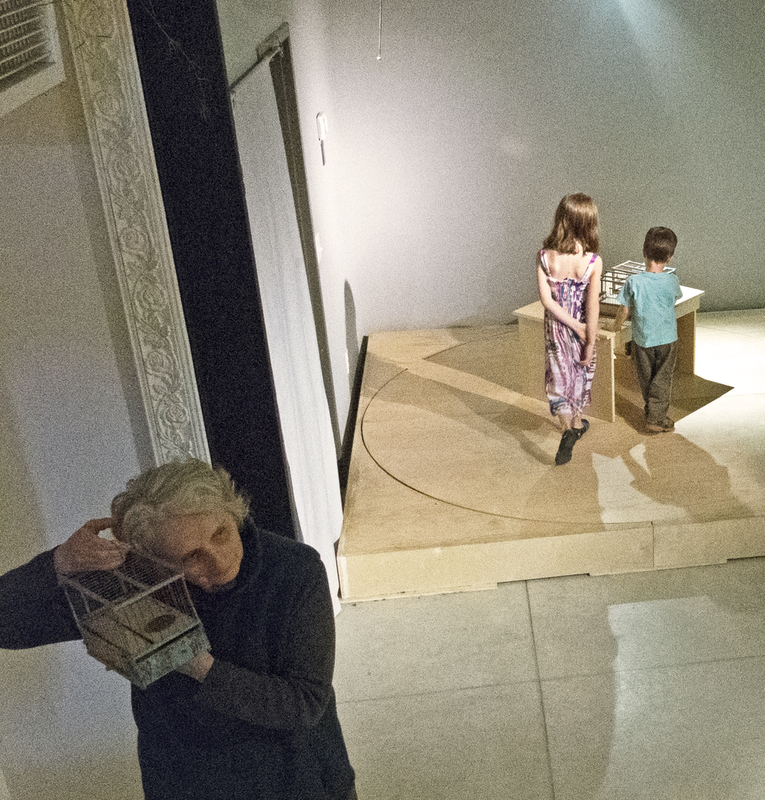 Still Here (II) is a spatialized installation that uses FM transmitters to aurally represent the deviation of the magnetic poles and the local magnetic field through the local, captive, avian perspective. One room on the second floor of 6018North is turned into a camera obscura. Paper screens hung in front of the window show the inverted image of the street. Copper foil and magnets on the screens also serve to transform the visual surface into an audible surface; these speakers play the displaced sounds of the street. Artist book, copper foil and magnet speakers, light diffusion and transparency images, desk with bone transduction speakers and back projection. Solo View addresses the story of Ivor B Webster, an Irish born U2 test pilot, who flew for decades with the CIA, Lockheed, and NASA. The implications of the observer as data collector are viewed through the personal and scientific materials that this pilot collected while on official missions as well as the recollections and observations of the pilot from those who knew him or knew of him. Speakers, visual and audio programming, infrared camera, projectors. 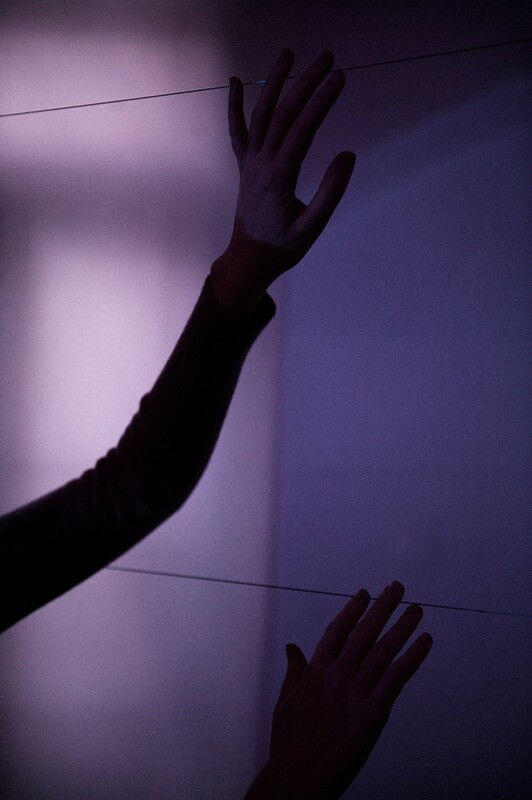 Interference and Harmony explores traces of bodily presence through abstract spatial markers. Bodies moving through an otherwise featureless room compose geographies that are temporarily visible and audible. The floor retains faint impressions of light that slowly fade; luminous shadows suggest networks of memory. Pulsing circles of light reduce in size and shift in color, according to the number of people sharing the space. Field recordings of electromagnetic emissions from electrical power sites inside 900 North Michigan Shops—floor guides, elevators, security barriers, video display screens, light fixtures, an ATM machine—are the basis of the soundscape. The stillness and proximity of visitors generates unique effects on the pitch and timbre of aural environment. With the entry of each additional person, another electromagnetic tone is sounded. This record is engraved with three locked loop recordings from a large EMU synthesizer. Play 3 copies of the record on 3 record players spaced around the room. At different speeds and spatially distributed, the sounds will affect each other through beating and harmonic relationships. 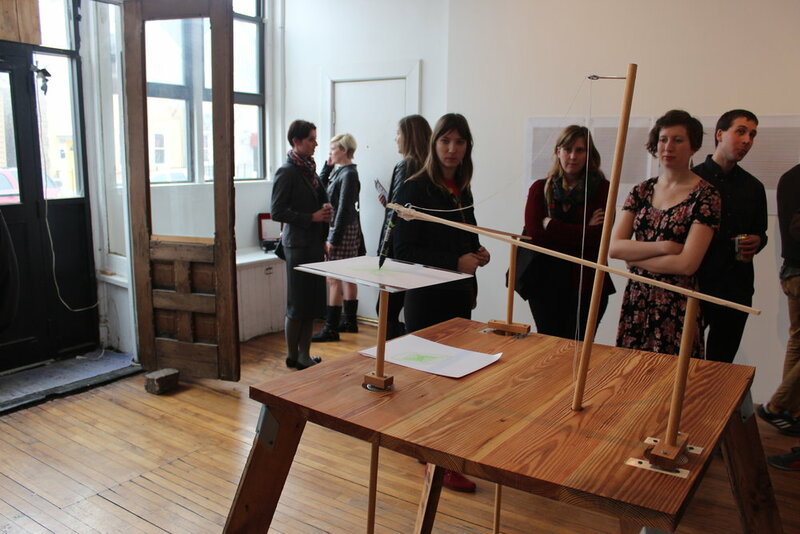 Produced in Chicago for Rounds, an exhibition at the ACRE Project Space that includes drawings and a harmonograph machine. Both the sonic and visual works represent simultaneous undulations through space that are pulled into a slower and more perceivable field of perception through their placement on relative planes.